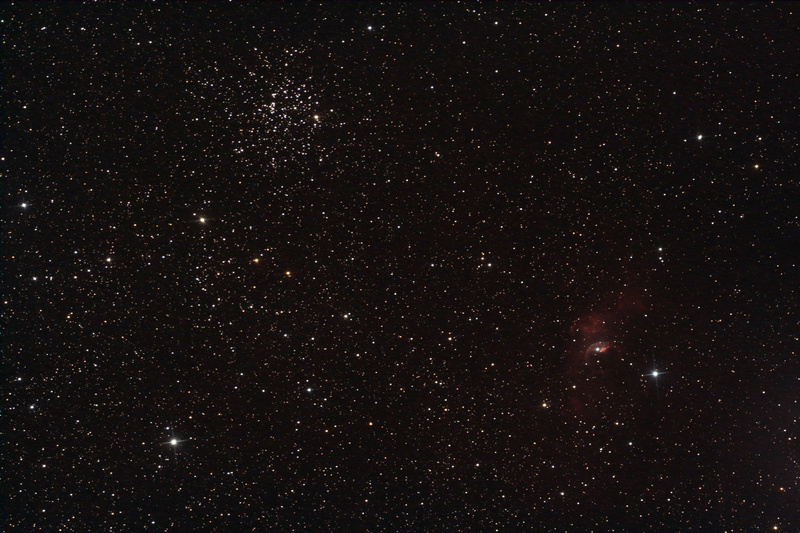 Recently Greg remarked that setting up a new astrophotography imaging system puts you right back at the beginning of the learning curve: How right he is! One problem after another needs solving, and you need a lot of discipline to focus on the problems and not fret about wasting good imaging conditions. Last Sunday we certainly did more than our fair share of problem solving in the twin domes of the New Forest Observatory. Multiple telescopes breed multiple problems! 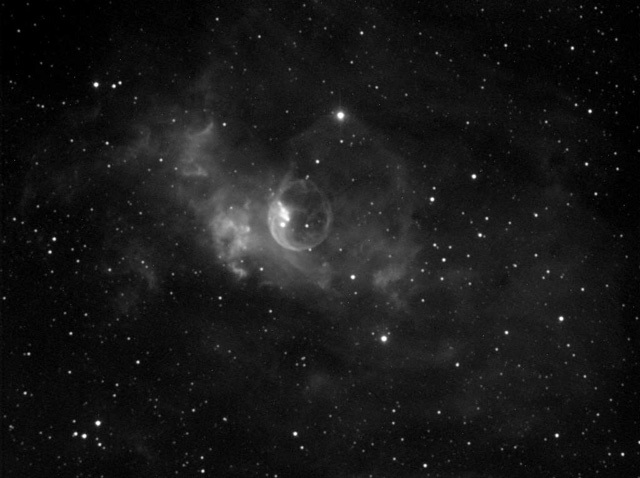 However, I did my fair share of fretting about the wasted imaging time. This was the first time I'd actually been at the New Forest Observatory during a decent dark, clear moonless night. I was extremely impressed about the lack of light pollution: Much better than the skies at the Curdridge Observatory. The Milky Way was clearly visible overhead. Once I'd got everything working, I was itching to try and image something. 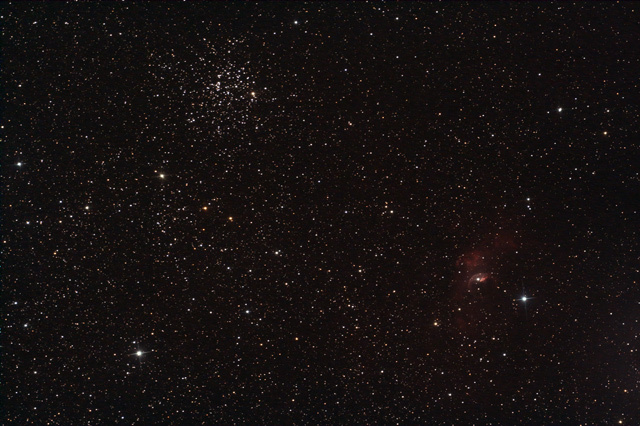 Lots of setup work remains (such as collimating the CCD cameras) but I was in a position to try some sort of imaging by about 11pm. The goal here was to prove we could synchronise and image with the two computers and two cameras at the same time, whilst using a dithering autoguider, calibrate the images (flat fields etc) and stack the data from both cameras together into a finished image. 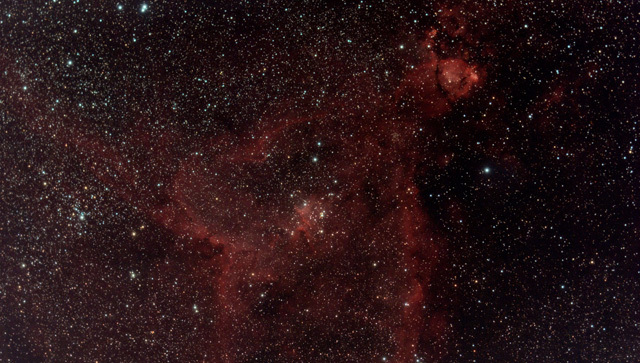 The result was never going to be beautiful - both cameras are out of collimation, and the focusing wasn't great, but I was able to gather some frames from the IC1805 heart nebula region with both M26C cameras on the two Sky 90 telescopes with just the light pollution filter in place. 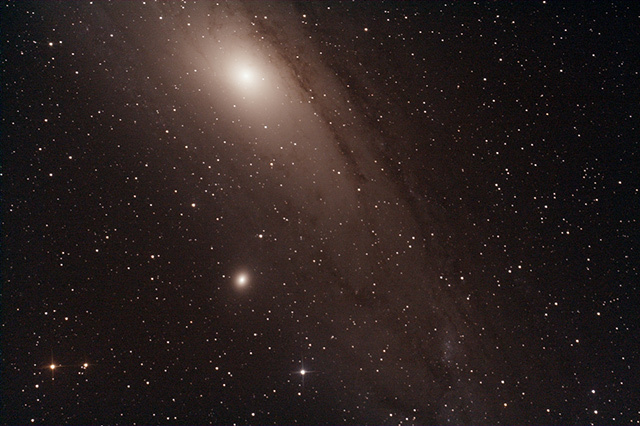 The two telescopes weren't particularly well aligned either, but the image below consists of about 2 x 5 x 600s frames - i.e. five frames of ten minutes exposure contributed from each camera. This is where I was reminded of the shocking power of the mini-WASP parallel telescope array: 100 minutes of data in 50 minutes of imaging. Seductive stuff. 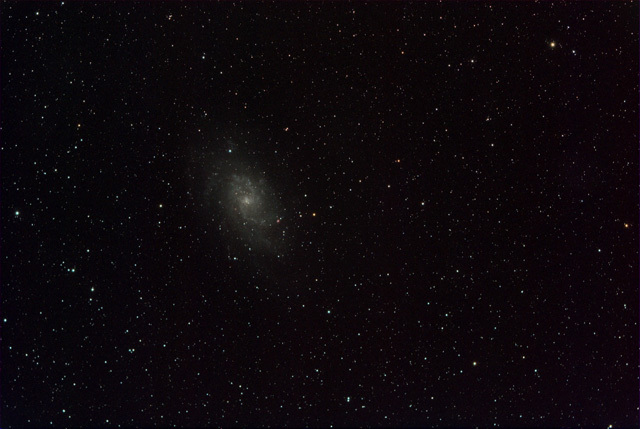 I also did a few frames in the M33 region which you can see underneath. This demonstrates the huge field of view of just one camera on the mini-WASP array.